The following papers and short notes have been formally accepted and published in Archives of natural history 42.1 in print and online in April 2015. 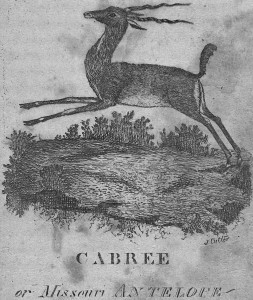 Engraving of “CABREE or Missouri ANTELOPE” from A topographical description of the state of Ohio, Indiana Territory, and Louisiana (Cutler, 1812) Courtesy of the Joseph F. Cullman 3rd Library of Natural History and the Smithsonian Institution Libraries, Washington, D. C.
P. G. AYRES: Isaac Bayley Balfour, Sphagnum moss, and the Great War (1914-1918). P. G. MOORE: Peeping at nature with the Reverend Charles A. Hall FRMS (1872–1965). H. Van GROUW and D. BLOCH: History of the extant museums specimens of the Faroese White-Speckled Raven. N. WOODMAN: Who Invented the Mule Deer (Odocoileus hemionus)? On the Authorship of the Fraudulent 1812 Journal of Charles Le Raye. H. FUNK: A re-examination of C J Temminck’s sources for his descriptions of the extinct Japanese wolf. J. HOLLIER, A. HOLLIER and C. SCHNYDER: The publications and collections of Louis-Albert Necker (1786-1861). C. GRIGSON: New information on Indian rhinoceroses (Rhinoceros unicornis) in Britain in the mid-eighteenth century. R. MEARNS, C. GOURAUD and I. CHEVRIER: The identity of Richard of Richard’s Pipit (Anthus richardi Vieillot, 1818). J. J. F. J. JANSEN and S. D. van der MIJE: Review of the mounted skins and skulls of the extinct Falkland Island Wolf (Dusicyon australis) held in museum collections. I. FRIIS: Coffee and qat on the Royal Danish expedition to Arabia – botanical, ethnobotanical and commercial observations made in Yemen 1762-1763. M. HOLMES: The Perfect Pest: natural history and the red squirrel in Nineteenth-Century Scotland (William T Stearn Prize 2014). P. FRANCIS: Philip Brookes Mason (1842-1903) – surgeon general Practitioner and naturalist. P. KOHLER: Józef Rostafiński’s ethnobotanical enquiry of 1883 concerning Polish vernacular names and use of plants. H. FUNK: Jan Černý’s Knieha lekarska (1517): closing a gap in the history of printed illustrated herbals. P. G. MOORE: New insights into the controversy surrounding marine biological laboratory (marine station) facilities in the Firth of Clyde in the early twentieth century. P. DASZKIEWICZ: Pyrenean plants for the botanical garden of Berlin – botany as a symbol of power during the Napoleonic era. S. L. OLSON: The Myth of the Malaspina Expedition in the Galapagos Islands. A. LESTER: Alfred Russel Wallace’s introduction to Botany through John Lindley. A. RICKIENE: Exercitia Phytologica (1792) by J. E. Gilibert in European libraries. A. LESTER: Botanical Contributions to the Library of Useful Knowledge. Isaac Bayley Balfour was a systematist specializing in Sino-Himalayan plants. He enjoyed a long and exceptionally distinguished academic career yet he was knighted, in 1920, “for services in connection with the war”. Together with an Edinburgh surgeon, Charles Cathcart, he had discovered in 1914 something well known to German doctors; dried Sphagnum (bog moss) makes highly absorptive, antiseptic wound dressings. Balfour directed the expertise and resources of the Royal Botanic Garden, Edinburgh (of which he was Keeper), towards the identification of the most useful Sphagnum species in Britain and the production of leaflets telling collectors where to find the moss in Scotland. By 1918 over one million such dressings were used by British hospitals each month. Cathcart’s Edinburgh organisation, which received moss before making it into dressings, proved a working model soon adopted in Ireland, and later in both Canada and the United States. Attention is drawn to the contents, pedagogic style and visual appeal of the 17-volume“Peeps at nature” series published by A. & C. Black between 1911 and 1935. Edited by the Reverend Charles Albert Hall (a Swedenborgian minister), who also contributed most of the titles, this series was a quality production but one that was cheap enough to be readily accessible to young readers. Its volumes were written in simple language and included colour pictures. With time, the flamboyant artistry of the covers that so characterized the earlier volumes was replaced by more muted designs, possibly to reduce production costs. Later contributors abandoned anthropomorphism and the moralizing tone of many nineteenth-century popularizers of natural history, although styles of writing varied between the early and later contributors to the series, becoming less technical with time. The white-speckled raven, a colour aberration of the Faroese raven Corvus corax varius Brunnich, 1764, has occurred on the Faroe Islands since at least the Middle Ages, and was always prized by collectors. In the second half of the nineteenth century while the Faroese raven population as a whole was suffering intense persecution, pied individuals were even more severely hunted, and were extinct by the beginning of the twentieth century. Details of twenty six specimens found in museum collections are given in this paper, as well as an overview of collectors on the Faroes who may have collected specimens. The captivity journal of Charles Le Raye was first published in 1812 as a chapter in A topographical description of the state of Ohio, Indiana Territory, and Louisiana, a volume authored anonymously by “a late officer in the U. S. Army”. Le Raye was purported to be a French Canadian fur trader who, as a captive of the Sioux, had travelled across broad portions of the Missouri and Yellowstone river drainages a few years before the Lewis and Clark expedition (1804), and his account of the land, its people, and its natural resources was relied upon as a primary source by generations of natural historians, geographers, and ethnographers. Based directly on descriptions of animals in the published journal, the naturalist Constantine S. Rafinesque named seven new species of North American mammals, including what are currently recognized as the mule deer (Odocoileus hemionus) and a Great Plains subspecies of white-tailed deer (O. virginianus macrourus). Unfortunately, Le Raye never existed, and historical, geographical, and ethnographical evidence indicates that the journal is fraudulent. Determining the author of this work is relevant to identifying the sources used to construct it, which may help us to understand the real animals upon which Rafinesque’s species are based. Traditionally, authorship of the volume was attributed to Jervis Cutler, but his role in composing the fraudulent Le Raye journal has been called into question. In this paper, I present additional evidence supporting the hypothesis that Jervis Cutler bears primary responsibility for the Le Raye journal and that he had the background, opportunity, and potential motive to author it. Unpublished manuscripts sent from Japan by the German physician and naturalist Philipp Franz von Siebold (1796–1866) to the Dutch zoologist Coenraad Jacob Temminck (1778–1858) show that Siebold possessed information about the now extinct Japanese wolf. This was confounded or ignored by Temminck when he used Siebold as source for his section on Japanese dogs and wolves in the volume on mammals in Fauna japonica with Siebold as general editor (1842). Temminck had used Siebold’s information for his naming of the Japanese wolf as Canis hodophilax in 1839. Temminck’s descriptions are analysed in comparison with Siebold’s manuscripts to clarify how Temminck obscured Siebold’s information. This paper includes reproductions of two unpublished drawings from Siebold’s draftsman in Japan and a brief discussion of the zoological status of the Japanese wolf. Additionally, a translation of the most important of Siebold’s manuscripts is appended. The Swiss geologist and mineralogist Louis-Albert Necker belonged to a family rich in scientific celebrities. Though a professor at the Academie de Geneve for 25 years and author of numerous publications, he is mainly remembered today for his description of the “Necker cube” optical illusion and for leaving Geneva to spend the last 20 years of his life in Portree on the Isle of Skye. As a first step towards assessing Necker’s contribution to science, a full list of his publications is presented, with comments about their citation in previous bibliographies and about published translations and abridgements. Information about the surviving specimens from his scientific collections, most of which are in the Museum d’histoire naturelle de Geneve, is also presented. Three Indian rhinoceroses (Rhinoceros unicornis) were present in Britain in the mideighteenth century. The first, a female, arrived in 1737, the second, a male, arrived in 1739, the third, a female known as Douwe Mout’s rhinoceros or Clara, was shown in London, probably in 1756. Recent research in British newspapers provides new information about all three animals, and produces evidence to show that the rhinoceros exhibited in London in 1751–1752 was not Clara, but the female which had arrived in 1737. Richard’s pipit (Anthus richardi) is an annual vagrant to Europe from its eastern Palaearctic breeding grounds. It was first described in 1818 by Louis Vieillot from specimens obtained in eastern France and named for Richard de Luneville. Although Richard was then a fairly well known natural history collector his identity became lost to succeeding generations of naturalists. He is identified here as Charles Richard (1745–1835), the director of the postal service at Luneville. Some of his bird specimens still survive amongst the Baillon Collection at La Chatre but other birds, including the three syntypes of Richard’s pipit, have not been traced. Only nine skins of the extinct Falkland Islands wolf, Dusicyon australis, are currently known in museum collections. In this article we present the results of locating these specimens with a special focus on the origins of two mounted skins in Naturalis Biodiversity Center, Leiden and in the Swedish Museum of Natural History, Stockholm, Sweden. Although only a few specimens were collected, their history is far more complicated than initially thought, and most of their documentary records are fragmented or lost. In spite of widespread consumption of coffee in Europe at the time of the Royal Danish expedition to Arabia 1761–1767, little was known of the cultivation of coffee in Yemen and of the Arabian coffee export to Europe. Fresh leaves of qat were used as a stimulant on the Arabian Peninsula and in East Africa, but before the Royal Danish expedition to Arabia this plant was known in Europe only from secondary reports. Two members of the expedition, Carsten Niebuhr and Peter Forsska°l, pioneered studies of coffee and qat in Yemen and of the Arabian coffee export. Linnaeus’ instructions for travellers requested observations on the use of coffee, but otherwise Forsska°l and Niebuhr’s studies of coffee and qat were made entirely on their own initiative. Now, 250 years after The Royal Danish expedition to Arabia, coffee has become one of the world’s most valuable trade commodities and qat has become a widely used and banned drug. Following the extirpation of the red squirrel from much of Scotland by the end of the eighteenth century, nineteenth-century naturalists strived to find evidence of its native Scottish status. As medieval accounts and Gaelic place names proved ambiguous, the true extent of the squirrel’s former habitat was a matter of some debate. While numerous reintroductions of the species were made from the late eighteenth century, general enthusiasm for the return of the squirrel quickly turned to dismay, ultimately followed by persecution. If the squirrel originally represented a symbolic mission to rediscover a lost species, the physical animal itself fell below expectations. It became publically perceived as both economically and ecologically destructive. The squirrel was despised by foresters and landowners for damaging trees, while naturalists condemned the species for the destruction of bird’s eggs and nests. This article will investigate naturalists’ quests to rediscover the red squirrel, before examining changing attitudes to the species upon its reintroduction and gradual proliferation. The narrative will emerge through the works and correspondence of Scottish naturalist John Alexander Harvie-Brown (1844–1916) and The new statistical account of Scotland (1834–1845). The argument will be made that the red squirrel as an object of antiquarian curiosity initially made the species endearing to natural historians, as part of a wider fascination with extinct British fauna. However, the clash between naturalists’ established ornithological interests did little to endear the species to that community, leaving the red squirrel open to a policy of general persecution on economic grounds. Philip Brookes Mason (1842–1903) of Burton-on-Trent, Staffordshire, was a medical doctor, a keen naturalist and collector. He first devoted himself to the study of botany, later Lepidoptera, then conchology and finally Coleoptera. His private collections, however, were of a wider nature accumulated both from his own gatherings and from purchases. He was an important figure in the Burton-on-Trent Natural History and Archaeological Society and in national societies including the Entomological Society of London and the Conchological Society of Great Britain and Ireland. He campaigned for a museum in Burton-on-Trent and his medical and altruistic achievements are also noteworthy. The current whereabouts of his collections are given in an appendix. In 1883, Polish botanist Jozef Rostafinski distributed a questionnaire to Poles with knowledge of peasant culture. Rostafinski asked about the names and uses of about 130 various plants, both wild and cultivated. About 370 individuals took part in the survey, sending nearly 860 letters. Only 359, sent by 227 correspondents, are now stored at the Museum of the Jagiellonian University Botanical Garden (Krakow, Poland). These letters contain nearly 25,800 records. Despite obtaining a vast amount of information from his enquiry, Rostafinski never made full use of the data. Rostafinski’s questionnaire occupies quite an early position in the history of ethnobotany. It was the most significant one at that time in regard of its size, issues included in the questions and the obtained results. The first original illustrated herbal in the post-incunabula period after 1501 was Knieha lekarska by the Bohemian physician Jan Cerny (c.1456–1530), written in Czech but printed in Nuremberg, Germany, in 1517. This work is missing in nearly all histories of illustrated herbals and, if mentioned, it is never systematically evaluated. The present paper introduces the author and analyses his work with respect to the tradition of early herbals, questioning the opinion that no remarkable herbal was produced in the first two decades of the sixteenth century. Three letters from the Sheina Marshall archive at the former University Marine Biological Station Millport (UMBSM) reveal the pivotal significance of Sheina Marshall’s father, Dr John Nairn Marshall, behind the scheme planned by Glasgow University’s Regius Professor of Zoology, John Graham Kerr. He proposed to build an alternative marine station facility on Cumbrae’s adjacent island of Bute in the Firth of Clyde in the early years of the twentieth century to cater predominantly for marine researchers.